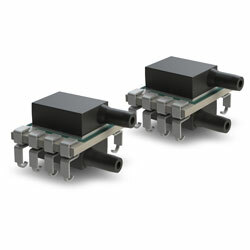 Bourns has expanded its line of environmental sensors adding an ultra-low 0.15 to a 1.0PSI pressure sensor. Bourns Models BPS110/BPS120 pressure sensors are based on state-of-the-art MEMS technology, which provides extremely accurate condition readings in a miniature package size. Designed to deliver superior performance in applications where precision is essential, the devices offer fully calibrated and compensated output for more efficient processes as well as long-term stability for reliable repeatability. These features make the company’s new pressure sensor an ideal solution for a range of industrial, consumer and medium/low-risk medical designs including portable oxygen generators, nebulisers, CPAP equipment, diagnostic spirometers and gas chromatography equipment. The sensors provide extreme sensitivity and stability with a TEB of 1.5% FS over a temperature range of 0C to +60C (Six-Sigma process), and lifetime drift of 0.5% FS. The new sensor models help to reduce system calibration requirements and help support system uptime. Its compensated plug and play shorten development time and provides superior design flexibility for use in either analog (BPS110) or digital systems (BPS120) where an amplified, calibrated pressure signal can be acquired from the digital interface or analog output.